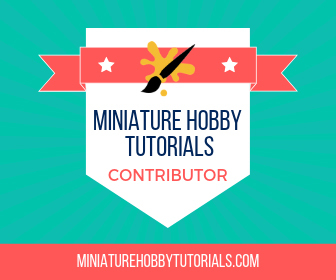 Brush Wizard: Unboxing: Super Dungeon Explore: Super Ninja Ambush! The box set contains 27 miniatures. 3 Ronin, 2 Mini-Boss Oni, 4 Elemental Shrine Paired Spawning Points and 18 Shrine Ninja. 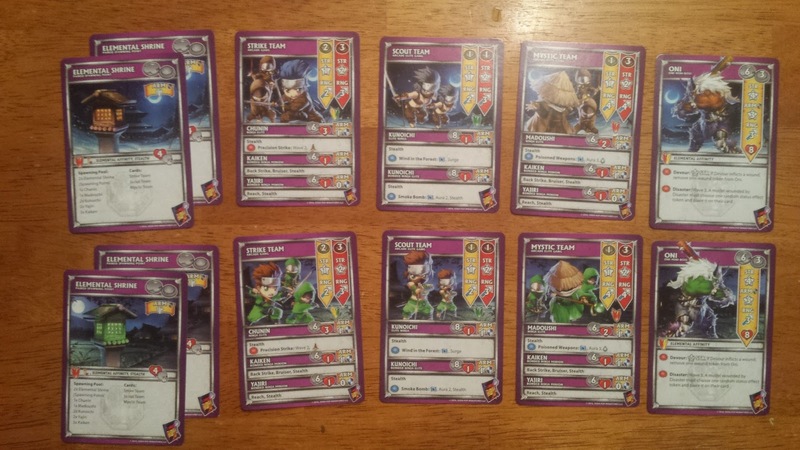 Plus all the cards needed to run them in either Arcade or Classic Mode Super Dungeon Explore. It also includes the Ronin cards for Ninja All-Stars, so you don't need to find them separately. Anyway, lets check this puppy out! Packed in the box are a set of three Ronin cards for use in Ninja All-Stars. 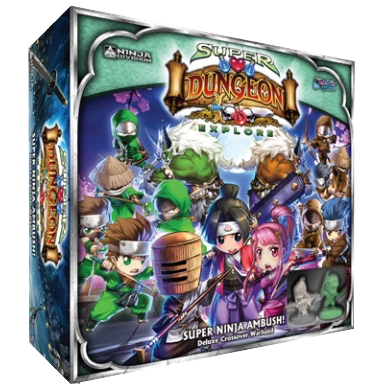 If you're buying this box only for the Super Dungeon Explore aspect of it all, these have no use for you. But if you want to use this set as a starting point of a ninja clan collection, you'll have the cards for your Ronin models without needing to look for them separately. 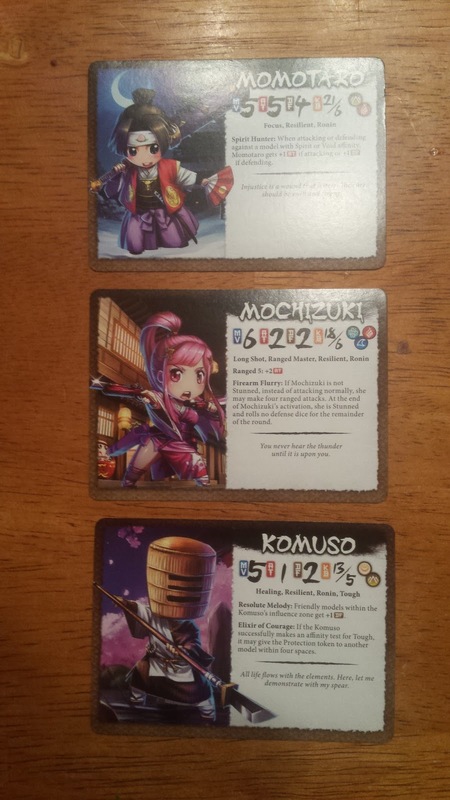 Each of the Ronin come with Hero cards for Super Dungeon Explore. In standard SDE fashion, they have had their named changed from character names to more regional names. For example, Komuso is now the Hidden Shrine Mystic. I'll go over their abilities later on. The full complement of Classic Mode cards. 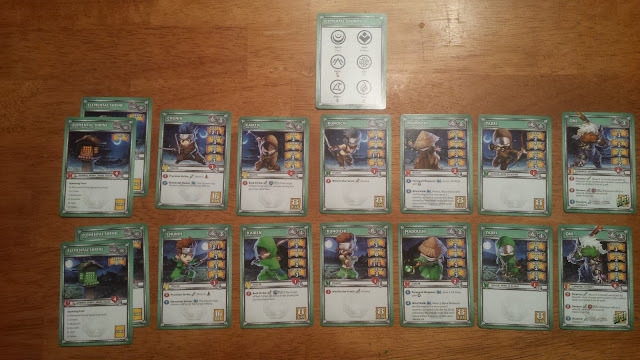 The green ninja cards have the same artwork as the Ninja Pack from the Ninja All-Stars kickstarter, while the brown ninja cards feature all new artwork. Also the art for both Elemental Shrines is brand new and different from the Ninja Pack's Elemental Shrine artwork. All of the cards needed for arcade mode. These are the spawning points of the set. They are a paired point, have Elemental Affinity, Stealth and Hidden, come stacked with 4 wounds, but only 1 star armor. With Stealth though, that means the heroes can't sit back and plink it with ranged attacks as easily as Stealth lowers the range it takes to hit them by 3 squares. All the ninja in this expansion have stealth too, by the way. Hidden is a new ability to Super Dungeon Explore and it allows monsters that spawn from it to be placed anywhere on the tile, not just within the normal 2 squares adjacent to it. I'm interested to see how well this works, since if you spawn monsters away from the point, you may end up leaving it open to easy hero attacks. Elemental Affinity - The biggest addition to Super Dungeon Explore with this set is Elemental Affinity. Before the start of the game, the Dark Consul chooses an element listed on the Elemental Affinity card (Spirit, Void, Earth, Wind, Water and Fire). Each element gives models with Elemental Affinity as a keyword on their card, a bonus effect. This effect ranges from being immune to knockdown, to forcing opponents to reroll a die in their offense roll. One ability, called Predator allows the model to make an attack against an enemy model that moves out of being adjacent, like Opportunity Attacks in Dungeons and Dragons. As I mentioned earlier, the Hidden Shrine heroes are actually the Momotaro, Mochizuki and Komuso, but instead are called the Hidden Shrine Master, Hidden Shrine Infiltrator and Hidden Shrine Mystic. The Hidden Shrine Master is your melee focused hero, he's also the fastest of the group at 7 movement points. He has a single offensive ability, called Tiger, which is a range 1 melee attack that adds a single red die to his STR. But it also has Pounce which allows him to jump up to 5 spaces toward the target before attacking. His defensive ability is called Ogre, which is a Wave 1, Push 1. Which means he can push all enemy models surrounding him 1 square away. While his potion grants him or any ally 1 action point. The Hidden Shrine Infiltrator is more ranged focused ninja. She can shoot up to 6 squares away or she can use her Crane offensive ability to shoot an enemy up to 8 squares away and pull them in 3, ala Scorpion from Mortal Kombat. Her defensive ability, Squid, grants allies within an Aura of 2, Stealth, making them harder to attack at range. Her potion is an emergency potion which lets her use it when it's not her turn. It is a Wave 1, Heal 2. The downside is if she's not careful she could possibly end up healing enemies as well. This set includes two Oni to use as mini-bosses, but mostly the second one is included for Ninja All-Stars reasons, as you can field up to two in your team. They are the sculpt from Clan Ijin, which in my opinion is by far the best of the Ninja All-Stars Oni. The Oni has Elemental Affinity, which gives him the bonus from the Elemental Affinity card, like the Elemental Shrine does. His main attack stat is STR, with which he swings for 3 Red Dice. He can bolster his attack roll with his Devour special ability, which adds in another 1 Red Die and allows him to remove a wound token from his card. His other offensive special ability is Disaster, which is a Wave 3 attack that also inflicts damaged models with a random status effect. Defensively, Oni comes with the fairly standard 6 Hit Points that we've seen on most mini-bosses in SDE. His armor is a respectable 2 red die. His defensive special ability is Deceive, a Range 6, Will vs Will with Compel 3, which is actually the exact same ability as the Hidden Shrine Mystic's Fox ability. The Chunin is the 16 bit monster of the spawning point, He comes equipped with 2 blue and 1 red die for STR. His offensive ability is Precision Strike, which is a melee attack Wave 2 that causes Knockdown on any enemies hit. His defensive ability is Elemental Master, which allows him to switch the point's Elemental Affinity. This means, you can use him to tailor the Affinity you need depending on how the game is going. The Kaiken are your general ninja monsters of the spawning point. They have a single star ARM and 3 Blue die for Attack, either STR or DEX. But where they specialize is attacking heroes in melee who haven't activated in the previous hero turn, with their Back Strike ability. Back Strike adds an additional blue die to their attack if attacking an inactive hero. The Kunoichi feature 3 Blue die for STR attacks and can use their Wind in the Forest ability to Pounce on Heroes from range. Unfortunately the Wind in the Forest ability does not add to their STR roll at all. But once they get into melee, they have 2 Red die for defense, which should make them a little bit better at survival than the Kaiken. One the surface the Yajiri may seem like the weakest of all of the ninja in the spawning point, since they don't have any special actions. They also have a 0 ARM, meaning they will die if hit at all. But, the Yajiri can shoot from up to 6 squares away, with 3 blue dice for DEX. But, they can also choose to forfeit all of their movement points to make a ranged attack, thanks to their Wind of Blades special ability. So, if you can screen them properly, it is possible to get 2 arrows per activation out of each model. And since they have Stealth, like all of the ninja in the spawning point, they are harder to hit with ranged attacks. I think they may be my favorite, which is funny because the Yajiri seem slightly useless in Ninja All-Stars. 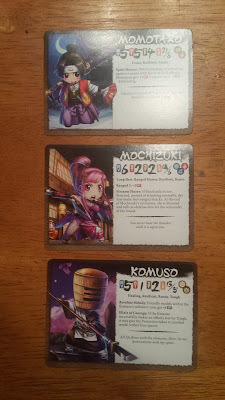 It actually surprised me that the Madoushi wasn't the 16 bit monster in the set, when I first looked at the cards in the Ninja Pack from the Ninja All-Stars Kickstarter rewards. I guess that's because he's a caster and I just assumed caster = 16 bit. Even without the 16 bit status, the Madoushi can be nasty. He has 2 hearts, but only 1 ARM. He can basic magic attack up to 6 squares away. He features 2 defensive special actions, the first is Poisoned Weapons, which is an Aura 3 and all Ninja gain the Poison status effect to their attacks. The second is Wind Walk is a Wave 3 and lets all Ninja in the wave area to go all Crouching Tiger, Hidden Dragon and Fly up to 3 squares, but they must end their movement within 3 squares of the Madoushi. And that's it for Super Ninja Ambush! I'm sure some folks will complain that these models are on Ninja All-Stars bases and not Super Dungeon Explore bases. But since they need to be usable in Ninja All-Stars, they need Ninja All-Stars bases, due to the little ninja star on the front of the base denoting facing. For me, that's not a big deal. I do plan on filling in the ninja star on the front of the bases though, as I bought this set exclusively for using it in SDE. 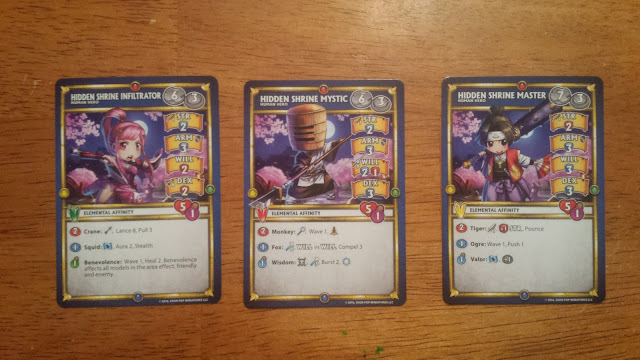 The only thing I wish that could have happened was that the Samurai Sentries would have been in the box to be used as Creeps for the Explore Deck. Also there isn't really a great ninja themed boss. At one time though, I was working on making Kunoichi Candy and Ninja Cola into a two stage Dungeon Boss. I may have to revisit that idea, if I can find my notes on it. I really like how they switched up the artwork on the cards for the Shrine Ninja and gave the brown team their own artwork. Also I noticed that the Spawning Point has new artwork as well, and it looks more like the model than the old art. That's a nice touch. That's it for now. These guys are going into the cabinet until I can decide on a color scheme for them all. At the moment I am leaning towards white or something that's not tied to any of the Ninja All-Stars elements. Also, they have something like 90 SDE miniatures in line before them too. So it may be awhile before they see paint. But hopefully not too soon!